Tis the season for trunk or treats, fall festivals, harvest bazaars, and more. Anytime we host an event at our church we need to be strategic about it. Otherwise, what’s the point? We should always have a purpose and a plan. Even if that purpose is simply to be a good neighbor, you need a plan to do that well. This is a key first step that many churches rarely think about. It’s easy to get in the habit of just doing things without thinking about why we’re doing them. Your stated mission and vision for your church should always be used as a tool to filter every ministry and event. First make sure it will be in alignment with your mission and help you make progress towards your vision. Hopefully your mission lines up with the Great Commission to “make and mature disciples.” Will your fall outreach event be in alignment with that mission? That all depends on how you organize it! Has your church taken the time to craft a vision statement of where you believe God is leading you as a body? If you have, will this event help you make progress towards that end? For some, these will be easy questions to answer, but for others this may challenge you to think about what you’re doing, not only in your upcoming fall event, but in other things you’re doing. In the end we would all love for many new children and families to visit our churches soon after the event, but are you ready for that to happen? Take a fresh look at your facilities, ministry leaders, and programs and ask yourself if you’re ready for more kids and families. What if you get 3 more or 10 or 25? I don’t want this to necessarily discourage you from holding your event, but if you’re doing this with a purpose in mind then you need to make sure you’re ready for a successful outcome. Having guests visit after an outreach event only to have them be turned off when they arrive is such a devastating missed opportunity! Be mindful it could have eternal consequences for them. Always be on mission! This is a great opportunity to mobilize more of your congregation into service. Express the value of their participation and encourage leadership. Any event you have is both an opportunity to reach more people outside the church and better engage the people you already have. Activating our congregations in the work of the ministry and providing opportunities for them to mature is a win-win. Before you can determine how best to publicize your event you first have to know who you’re trying to reach. If you’re an urban or suburban church wanting to reach your local neighborhood then canvasing the area with flyers or door hangers may be effective. If you’re a rural church, then casting a wider net may be necessary so a mailer to a zip code might be the easiest way to reach people. Of course, most Halloween alternatives are going to be geared towards children and families so doing some research and targeting just that demographic may prove more effective in outcome and cost. Social media may be an effective way of reaching a targeted audience if you communicate well to your social media followers that they must share your event information so that the friends of your followers get it. If you have an advertising budget, paid ads may also help you reach a wider audience than the cost of printing and mailing flyers. The typical “trunk-or-treat” is a popular fall event, but most attractive to elementary age children and their parents. Consider (also or instead) targeting junior high and high school kids with different activities that would be more attractive to them such as sports or games, music and movies. It could be a good way to introduce your student ministry leaders and students to some new kids. Holding an event with no way to communicate with the guests later is certain to produce lower direct results. Be sure the information gathering process is not prohibitive to them getting in and having fun. Find a way to keep it quick and simple; name and email may be all you need. One or two more information items may be acceptable, but beyond that you may be creating a point of frustration before they ever even get in. Handing them a connect card when they arrive (maybe from a parking lot attendant) that they can drop off later at a booth or table for a chance to win a prize may be a good way to get more people to participate and allow you to get more information. Make the prize something good and have signs around advertising it! The connect card is a good place to have a brief Gospel-centered message on the back and your church service times. That way if they don’t turn it in, they still know why you’re having the event in the first place (because Christ loves them and so do you) and how to take a step towards you if they choose to. If they do turn it in then hand them another card with information about the prize and again why you had the event and how they can connect with you. You held a great event and you collected good information. Now what? First, say thanks and invite them to the next thing you’re doing. Maybe that will be your Christmas Eve service or something sooner. If your church is having any kind of Thanksgiving outreach to feed people in need then you may have just met a family that could benefit from your next outreach and another chance to begin building a relationship with them. Remember, it will take many contacts to get someone to respond. Don’t overdo it in the first three weeks and don’t give up. A couple contacts in the first couple weeks will be good and then spread them out to maybe once a month or less frequently for special events. Communicating things that are particularly helpful for people such as financial training, divorce care, or addiction recovery are good things. Also, just letting them know that you would like to have their family become a part of yours (church family) is just showing kindness and we all need to see more of that these days. Our team created a free Easter Assimilation plan that can easily be adapted and applied to following up with guests from your fall event! You can download that for free here. Fall Outreach Events are a great opportunity to love our neighbors, share Christ, and invite people into the family of God. Do not fall into the trap of doing events out of the sake of habit. 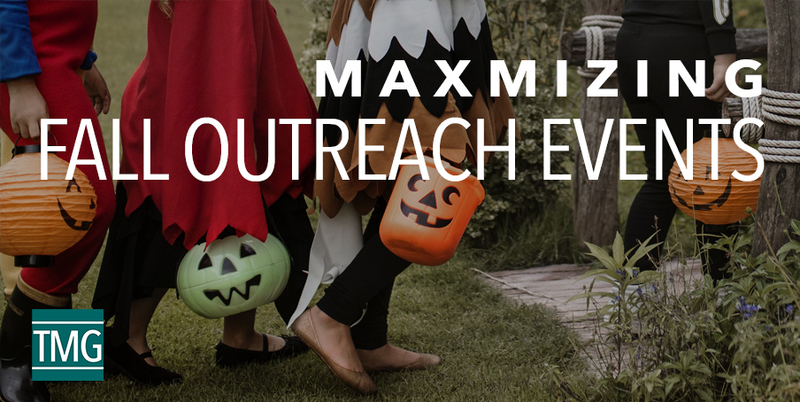 By simply being intentional, your church can maximize your fall outreach events to make an impact for Christ. TMG President, A.J. Mathieu, spent most of his adult career as a technology business owner and local elected official. He is a leader in his church focusing on divine design and leadership development. A.J. and his wife, Erika, have two boys and live outside Fort Worth, Texas.